"Some things are worth fighting for, and I think your family and your home are two of those things." The foreclosure crisis lies at the very heart of the broader economic collapse. The glut of foreclosed properties on the market forced housing prices into a tailspin, and banks loaded up with mortgage-backed securities and complex derivatives, unable to value or sell these assets, stopped lending to each other and the credit markets froze up, triggering the broader economic morass. A broad and successful economic recovery is impossible without directly addressing the record foreclosure rate that lies at its heart. If we do not take any action, Credit Suisse predicts that there will be between 8 and 9 million foreclosures in the next four years, at a potential cost to the economy of $702 billion. 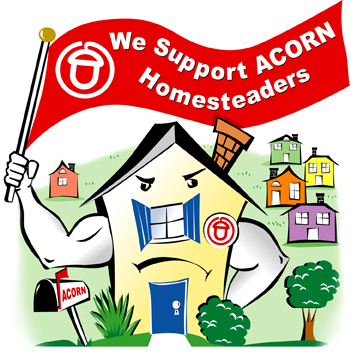 ACORN members are launching a Homesteading effort as part of ACORN's comprehensive foreclosure campaign. ACORN is working with its membership and activists around the country to build "Home Defender Teams." These teams will be prepared to mobilize on short notice to peacefully help defend a family's right to stay in their homes until a fair solution to the crisis is put into place by the new Administration. We are recruiting allies and elected officials to support our efforts and call for a full and comprehensive solution to this crisis. Are you willing to be a Home Defender in your community? If you live in one of these Tier 1 cities, your help is needed with the initial roll-out of the Homesteading campaign. Trainings will take place the second week of February and the kick-off events will be held the 3rd week of February. If you live somewhere else, you can still help! Please sign up below and an ACORN organizer from your area will contact you with details of how this campaign will roll out and how you can help stop the foreclosure crisis in your community and nationwide.